Hey friends! This is a busier than usual week for me, which means I’ll be relying heavily on my slow cooker. There is nothing like having supper waiting on me at the end of the day and all I have to do is pass out plates! 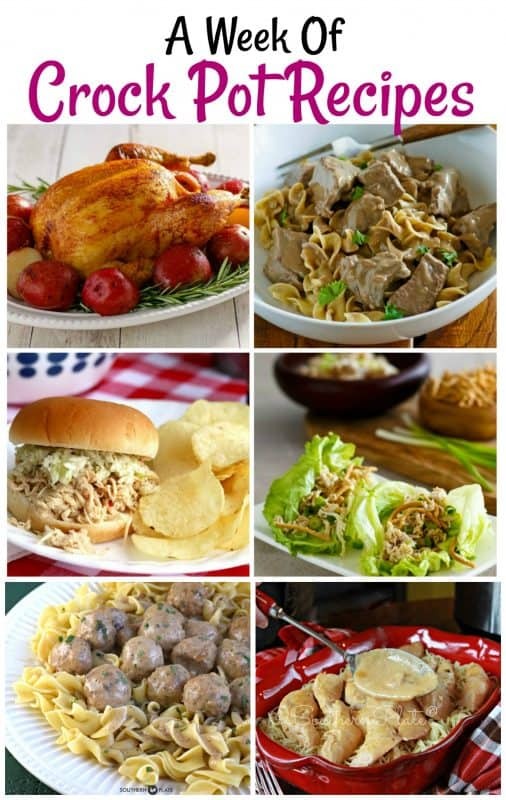 Today I thought I’d share with you a week (7 whole days) of supper ideas in your slow cooker! The links to all of these recipes may be found below. 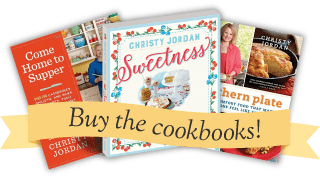 Head on over and print off each of these recipes to add to your files – or better yet, claim your Southern Plate Recipe Box (it’s free!) and save each of them there. This recipe box is a brand new feature on SouthernPlate and I know you are going to love it! Signing up is easy, simply click on the little recipe box at the top left corner of your screen and sign in to create your box. After that, just click the little blue heart that will appear beneath the recipe box button on any post. 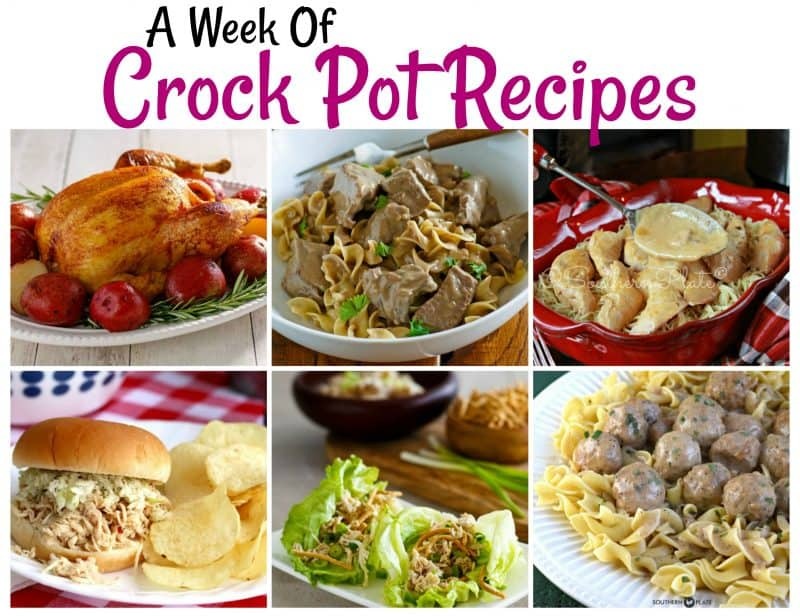 Once you’re done, here are the week’s worth of Crock Pot recipes I promised! I hope you enjoy this new feature on SouthernPlate. Thank you for the honor of letting me be a small part of your wonderful family. Enjoy adding all of your favorite recipes to the box! Click below to share this post on your Pinterest! This is so helpful . . . these recipes are awesome! Thank you for sharing. Thank you Tricia, I hope you get the chance to enjoy a few of them! I tried to become a member of the recipe box but when I filled out my email addy then clicked on NEXT it kept popping up to click on I AM NOT A ROBOT. No where is there anything to click this on. Oops…rebooted and it showed up. Sorry about that. I just checked to make sure you were signed up okay. Glad to have you! I am so glad to have this feature! You wouldn’t believe the shenanigans I’ve have gone through to save your recipes! Sadly, I’ve lost so many, or forgotten what/where I tried to save them (emailed to myself, Pinterest, etc). You have wonderful recipes and this will make it much easier. Thank you! Our own recipe box! I am so excited!! Thank you, Christy!!! I have been back a couple of times to try and sign up but I haven’t been able to yet. I am guessing it is because every one else is just as excited as I am, and it is busy. I will be back later! 😀 I want to thank you, Christy, for having the best recipes, ones that I know will be delicious before I even try them; and for making this one of the best, friendliest, and fun places to visit. You try so hard to please us all and I am very grateful for the caring and all the hard work you put in for us. Is anyone else having trouble getting past the “I’m not a robot” thing? I clicked on it about 5 minutes ago and it is still sitting there turning. I got completely out and tried again – still does the same thing. Help! I’m so sorry! I would try completely closing your browser and then starting with a fresh browser. Are you signing in with Facebook? I made the rotisserie crockpot chicken, cooked it on low for 7 hours and it fell off the bones, do you think 6 hours would have been long enough? However it was great tasting! Hey Beulah! It sounds like it. You can always stick a knife in it and see if the juices run clear. I’m so glad you enjoyed it either way! Attitudes like yours make this world a beautiful place! thank you for the recipe box and i have made several of your recipes and my family and i have loved them. Great ideal on the recipe box!!!! Thank you for the recipe box. I signed up yesterday. This will very convenient. This is what I get when I try to send your recipes to the recipe box. No Recipes found in your southernplate.com folder Please help me. This is a wonderful way for me to keep track of your recipes. Thank you for the recipe box! I am sooo excited to have this way of saving your delicious recipes!!! P.S. Make sure you are trying on a desktop computer, it’s much easier that way.